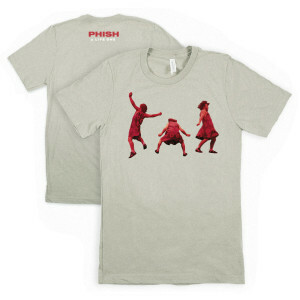 Fish x 3 printed on a 40/60 cotton poly blended heathered soft t.
image is great and reminds me of being 13 years old and looking through the photos in the liner notes over and over again, with every play of A Live One, which was a lot... it's why i had to order it! canvas shirt company for some reason has taken over the market or bands and their merch. they are extremely unreliable in sizing. i am normally a Large, but have to buy XL in their shirts due to how small they run...they are not stating that they are slim fit. i had to give away my Big Boat shirt because it was so small, but when i bought the tour shirt in SC for fall tour '16, i bought the large and it fit great. Stoked on shirt and got 2 nye tickets thank you phish counting the days .